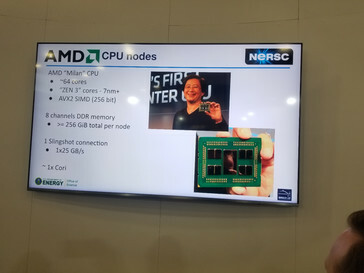 The EPYC Rome server-grade CPUs have just been revealed to have 64 cores and 2.35 GHz clocks, but it looks like AMD is already working on the successor that will be based on the Zen 3 architecture. 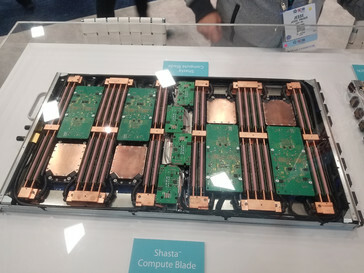 According to the U.S. Department of Energy, the upcoming CPUs will be known as the EPYC Milan, will have more than 64 cores, and will be featured in octa-CPU nodes along with Nvidia's 'Volta-Next" GPUs in the Perlmutter supercomputer. AMD is a few months away from releasing the world’s first 7 nm desktop/server processors. The red team is already doing great in the desktop sector, but the server side is just beginning to see increased market share, especially with the new EPYC Rome chips that have recently been announced. 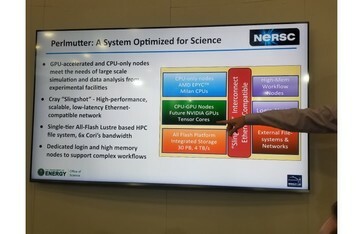 Supercomputers nowadays also tend to integrate a mixture of server-grade chips and GPU clusters, and it looks like the U.S. Department of Energy has chosen AMD and Nvidia as partners for its upcoming Perlmutter project that was revealed at the Supercomputer 2018 event. 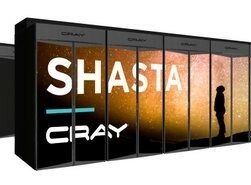 What sets this exascale-class endeavor apart from everything we’ve seen so far is the plan to include the unannounced EPYC Milan 7 nm+ CPUs based on the Zen 3 architecture combined with Nvidia’s “Volta-Next” GPUs. The future Perlmutter supercomputer will use the modular Shasta Compute platform from Cray, which allows to interconnect a series of compute blades made up of watercooled CPU nodes and GPU clusters. 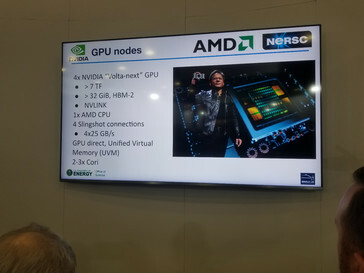 The CPU nodes will integrate eight EPYC Milan CPUs and 256 GB of 8-channel DDR memory that is also watercooled. 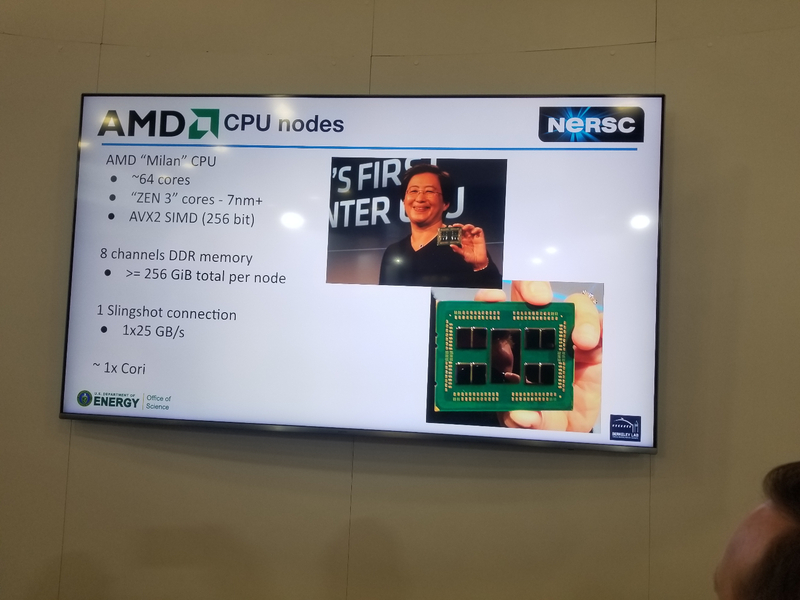 Even though the slides presented by the DOE say that the EPYC Milan CPU will integrate 64 cores, it was later rectified that the 64 cores are actually from the EPYC Rome and the Milan models will most likely get more cores. 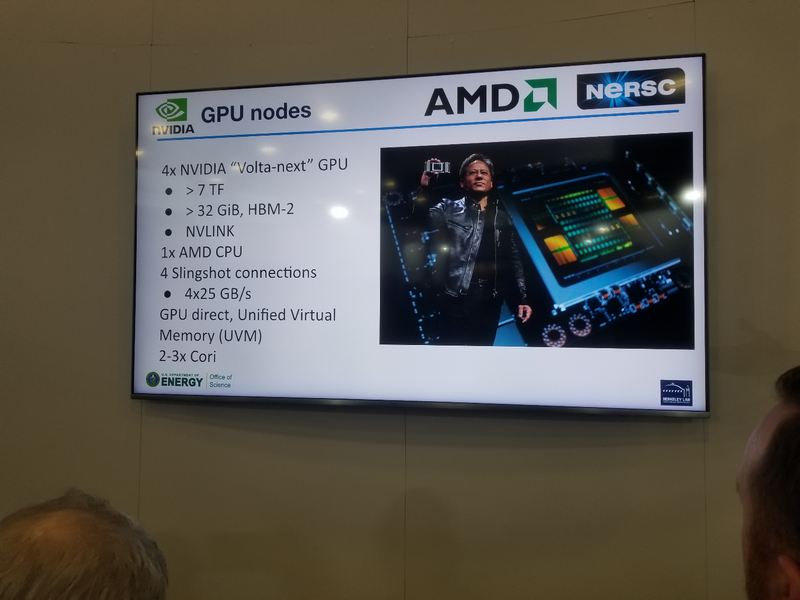 As for the “Volta-Next” GPUs, not much is known besides the fact that they will obviously be faster than the current-gen V100 compute clusters. With so much hardware under development at the moment, the Perlmutter is expected to go online some time in 2020, an this looks to be in sync with AMD’s roadmap for the Zen 3 architecture.